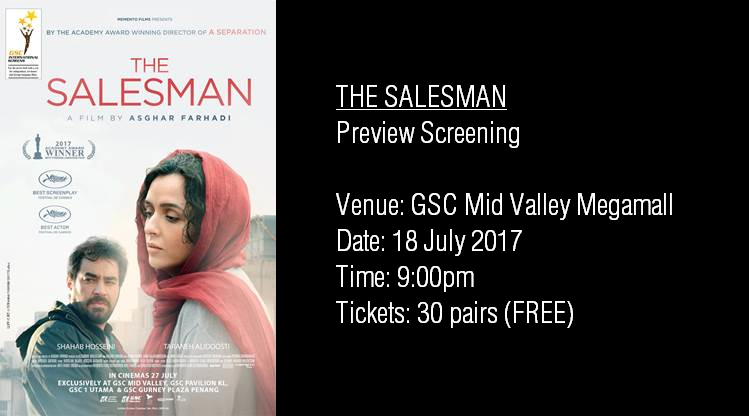 Golden Screen Cinemas (GSC) – International Screen and ColourlessOpinions.com are collaborating once again to bring you the preview screening of The Salesman (Forušande) — the recent winner of the Academy Award for Best Foreign Language Film, and also awarded the Best Screenplay (Asghar Farhadi) and Best Actor (Shahab Hosseini) at the 2016 Cannes Film Festival. The film currently holds a 97% score on Rotten Tomatoes based on 154 critical reviews. Directed and written by Asghar Farhadi whose film A Separation also won an Oscar for the same category back in 2012, The Salesman is an Iranian drama about a young couple in Tehran named Emad (Shahab Hosseini) and Rana (Taraneh Alidoosti) who are forced to move to a new apartment after their old flat was damaged. An incident linked to the previous tenant dramatically changes the couple’s life. According to Farhadi, the film deals with the complexity of human relations, especially within a family. Tickets: 30 pairs available to be redeemed. Free seating. Redemption begins 8:00 PM onwards. Maximum two (2) tickets per person on first-come, first-serve basis. While tickets last. How to Redeem: Using your mobile phone, simply present a snapshot of this post (yes, this very one that you’re reading now right here), and the one posted on our FB Page, at the Ticket Entrance of venue at 8pm on the screening day. There will be a redemption table there with nice people giving away the tickets until they’re all taken.